President Bush installed embattled nominee John Bolton on Monday to be U.N. ambassador, using a recess appointment to circumvent a resistant Senate. "This post is too important to leave vacant any longer, especially during a war and a vital debate about U.N. reform," Mr. Bush said. He called Bolton "one of America's most talented and valuable diplomats." The move ends a five-month impasse with Democrats who accused Bolton of abusing subordinates and twisting intelligence to fit his conservative ideology. Bolton went directly from the White House to the State Department where he was sworn in. Within five hours of his appointment, he arrived at the U.S. Mission in New York to begin work. Bolton joined the president and Secretary of State Condoleezza Rice at the White House announcement ceremony. "It will be a distinct privilege to be an advocate for America's values and interests at the U.N. and, in the words of the U.N. charter, to help maintain international peace and security," he said. Under the Constitution, the president may issue an appointment and bypass Senate confirmation when it is in recess. Such an appointment ends when the next session of Congress begins – January 2007, in this case. Mr. Bush blames Democrats in the Senate for keeping the Bolton nomination from getting an up or down vote, which the White House is certain would have confirmed Bolton, reports CBS News Correspondent Mark Knoller. Bush had refused to give up on Bolton even though the Senate had voted twice to sustain a filibuster against his nominee. Democrats and some Republicans had raised questions about Bolton's fitness for the job, particularly in view of his harsh criticism of the United Nations. U.N. Secretary-General Kofi Annan welcomed Bolton's appointment and steered clear of the controversy over whether Bolton would be weakened by the recess appointment. "We look forward to working with him as I do with the other 190 ambassadors, and we will welcome him at a time when we are in the midst of major reform," Annan said. Annan also pointedly noted that Bolton was one of many U.N. ambassadors. "I think it is all right for one ambassador to come and push," he said, "but an ambassador always has to remember that there are 190 others who will have to be convinced, or a vast majority of them, for action to take place." Senate Democratic Leader Harry Reid of Nevada said Bolton was a "seriously flawed and weakened candidate." He said Bush "chose to stonewall the Senate" by using a recess appointment. Senate Majority Leader Bill Frist, R-Tenn., said, "The president did the right thing by sending Mr. Bolton to the U.N. He is a smart, principled and straightforward candidate, and will represent the president and America well on the world stage." "It's a devious maneuver that evades the constitutional requirement of Senate consent and only further darkens the cloud over Mr. Bolton's credibility at the U.N," Kennedy said. A senior Republican said Bolton's appointment had been delayed long enough. "If the president recess-appoints John Bolton, I can understand why because he's been waiting a long time to get the person that he believes is the best to represent his administration at the U.N," said Sen. Mitch McConnell, R-Ky.
McConnell said he doubted that a recess appointment would have a strongly negative impact on the atmosphere in the Senate. If Mr. Bush withdrew the nomination, no ambassador would be in place when the U.N. begins taking up important issues in the fall, he said. "Bolton's been sort of twisting in the wind since March," McConnell said. "Bolton's exactly what the U.N. needs at this point. The president's right on the mark in picking him." The administration has promoted Bolton for a hard-nosed style that officials believe will help push reform in the United Nations. Opponents say his criticism of the world organization and reports that he has abused underlings and sought to punish those who disagreed with him render him unfit for the position. CBS News Foreign Affairs Analyst Pamela Falk says that for Bolton to be effective at the U.N., he "will have to learn who's who before the September General Assembly opens. The 60th anniversary session will deal with terrorism, Iraq, the Middle East and Africa and the ambassador will have to be a diplomat." 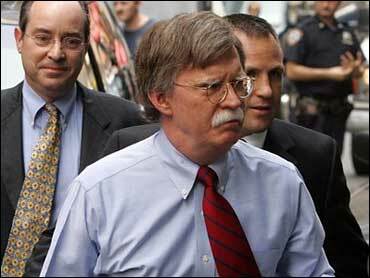 Falk says Bolton "will also be at the U.N. for the election of a new Secretary General since Kofi Annan's term ends in 2006." In recent weeks, the Bolton controversy faded into the background as the Senate prepared to begin a nomination battle over John Roberts, the federal appeals judge that Mr. Bush chose to replace the retiring Justice Sandra Day O'Connor at the Supreme Court. Separately, Democrats and the White House deadlocked over Bolton's acknowledged request for names of U.S officials whose communications were secretly picked up by the National Security Agency. Democrats said the material might show that Bolton conducted a witch hunt for analysts or others who disagreed with him. Democrats said that was not good enough, but later offered a compromise. After much back and forth, with the White House claiming Democrats had moved the goal posts, no other senator saw any of the material. Last week, the administration telegraphed Mr. Bush's intention to put Bolton on the job. White House press secretary Scott McClellan said the vacancy needed to be filled before the U.N. General Assembly's annual meeting in mid-September. Former Sen. John Danforth left the post in January. In the face of objections from most Democrats and at least one Republican, Mr. Bush has steadfastly refused to withdraw Bolton's nomination — even after the Foreign Relations Committee sent it to the full Senate without the customary recommendation to approve it. Critics raised fresh concerns last week when it surfaced that Bolton had neglected to tell Congress that he had been interviewed in 2003 in a government investigation into faulty prewar intelligence on Iraq. In a letter released Friday, 35 Democratic senators and one independent, Sen. Jim Jeffords of Vermont, urged Mr. Bush not to give Bolton a recess appointment. "There's just too much unanswered about Bolton, and I think the president would make a truly serious mistake if he makes a recess appointment," Sen. Joseph Biden of Delaware, the top Democrat on the Foreign Relations Committee, said in an interview.